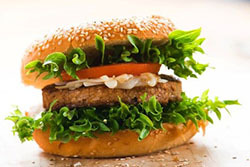 Food companies are making rapid inroads on bringing innovative plant-based meat alternatives to market that align with consumers’ desire for meals that are healthier and better for the environment. With names like Impossible Foods, Beyond Meat and Memphis Meat, there is a new breed of food company emerging that is focused on creating meat alternatives to meet consumers’ increasing interest in adding more protein to their diet. We might regard Carl’s Jr.’s partnership with Beyond Meat to produce a meatless version of its classic Famous Star burger and White Castle’s offering of Impossible Sliders as a harbinger of innovation in fast food burgers. Impossible Slider burgers (developed by Impossible Foods) are described as plant-based patties “that look, taste and ‘bleed’ just like real meat.” Real meat indeed. 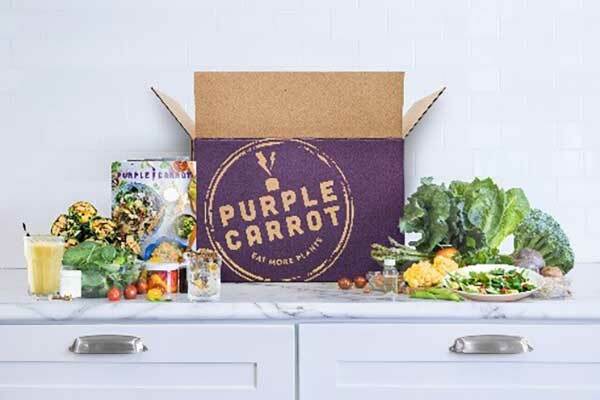 Today’s consumers increasingly prefer meals that are healthier and better for the environment. More consumers than ever are experimenting with their diet and are trying various approaches to eating — many of them involving plant-based foods. 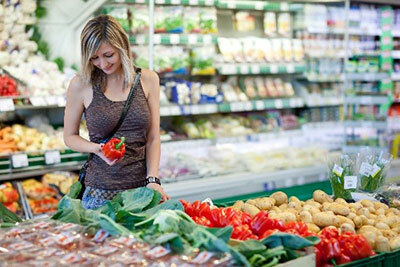 Consumer interest in plant-based foods has been gaining momentum for several years. Our own Diners’ Changing Behaviors report in 2015 found almost one-fifth (18%) of consumers said they were ordering more plant-based foods than before when dining out. What’s driving consumers toward plant-based proteins? The rise in consumer demand for meat analogues is being driven by three dynamic trends in food culture today: health and wellness, sustainability and culinary engagement. Health and Wellness. Consumers are expressing greater interest in enhanced mind/body functionality by replacing refined carbohydrates with a wide range of proteins and fat-rich foods. They are also looking for a greater diversity of nutrient sources in their diets while expressing concerns relating to the perceived health impacts of industrially processed red meat, notably chemicals (e.g., antibiotics, hormones). Culinary Engagement. As consumers broaden their culinary engagement through new food and beverage experiences, meat substitutes are proving fertile territory for experimentation and novelty in their diets. Culinary engagement is also creating greater exposure to and interest in vegetable-focused cuisines and traditions. Consumers today are trying to manage their diets by avoiding “harmful” ingredients while increasing intake of plant-based foods. 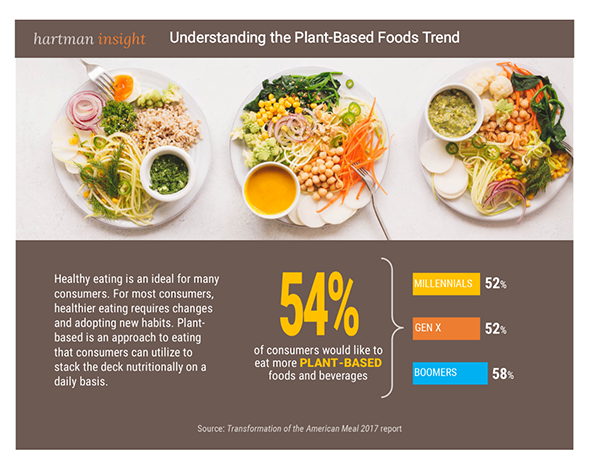 Our Health + Wellness 2017 report finds that consumers are seeking plant-based ingredients like fiber, and an array of plant-based products can help with their protein priorities. Among the ingredients consumers are adding to their diet, they continue to look to fiber (63%), protein (60%), vitamin D (59%), whole grains (58%) and nuts and seeds (57%) to help them feel full — with a sense of sustained energy — throughout the day. Although consumers in the U.S. still eat a great deal of meat, dollar-sales growth of meat alternatives has bested animal-based protein for several years. Hartman Group analysis of Euromonitor data finds that retail sales for “meat substitutes” in 2018 were $1.4 billion, with a CAGR of 21% in the period 2015 to 2018. This growth occurs even though mainstream consumers are just getting their bearings in the category. An emphasis on the amount of protein, rather than its source. Emphasis on what the product is free from (e.g., animal products, soy, gluten, GMOs), rather than what it is. Consumer interest in meat analogues is likely to continue to grow. At present, it is likely that knowledge of which meat analogues contain which protein is weak among mainstream consumers or light users of the category. When conscious of their protein choice, consumers are weighing up a range of different considerations, including their experience of the product, accessibility of the product and attitudes around health and wellness, sustainability and culinary engagement. Protein choices are therefore likely to be highly influenced by consumer engagement with health and wellness and sustainability.